1. Root up brambles (we have lots of those!). 4 Eat poison ivy. !!!!!!! 5. Do well on pasture and in woodlot areas. 7. Dig a shallow pond for you… uh, maybe. 8. Consume all of the extra fruits and vegetables we don’t use or sell. 9. Be very economical sources of meat if managed correctly. 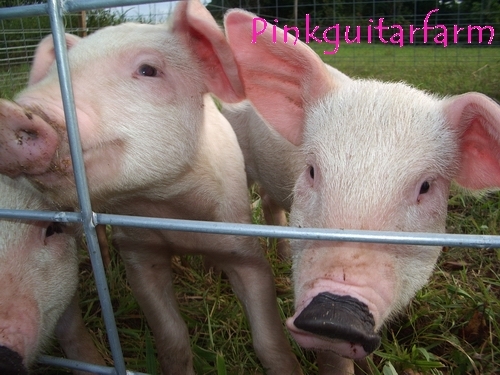 We initially got 3 six week old Yorkshire cross piglets and raised them through the winter. They tilled the soil until it froze. We then decided that it might be a good idea to breed them – perhaps we were not quite ready to eat them? Eating what we raise has been an interesting journey…another post for another day. Then we learned about the wonderful Red Wattle Hog through various sources, but most importantly, through Econtonefarm. We found these great folks when we got our Narragansett turkeys. 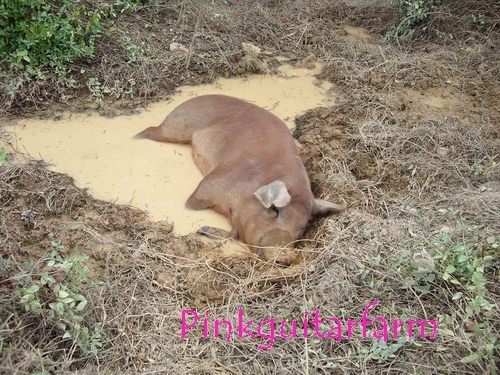 They have a lot of good information about the Red Wattle Hog on their blog. 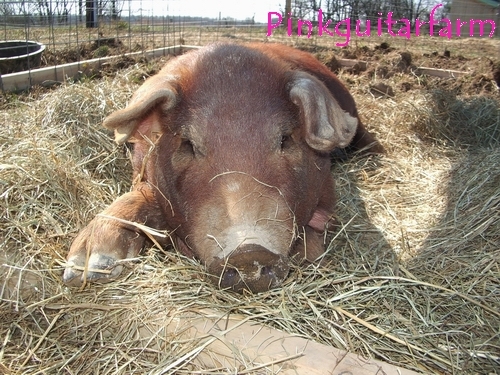 So, in early spring, we purchased a registered Red Wattle Hog boar to be our “herd” sire. He was 4 months old – we got him from Jan Black in Dover, TN. He is a lazy, docile boar. 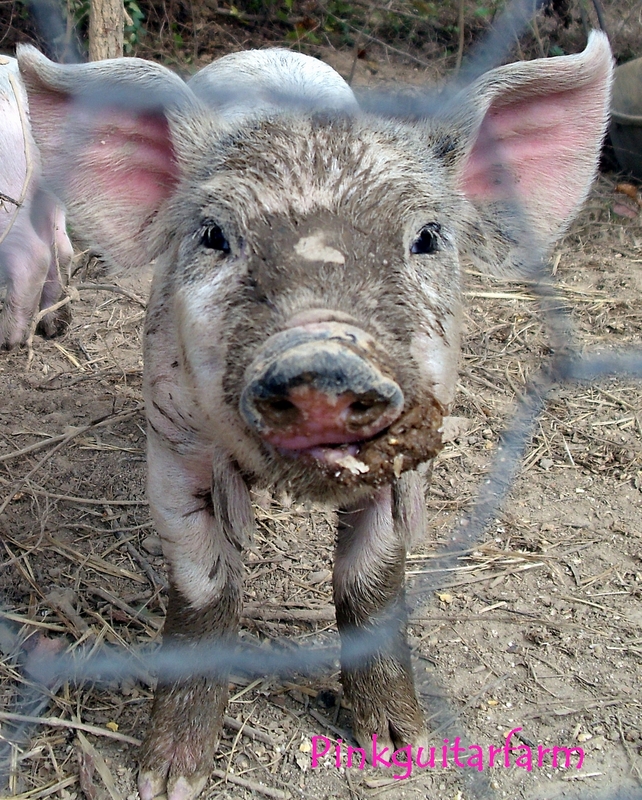 We were not sure he would be of much assistance in the “piglet project” but by May, he developed, shall we say – more energy. On Labor day, we got our first litter of 6 piglets. Two days later we welcomed 4 more. Two days after that, an additional 5 healthy piglets. 15 total! We were told that it was important to separate the boar from the gilts and piglets for their safety. 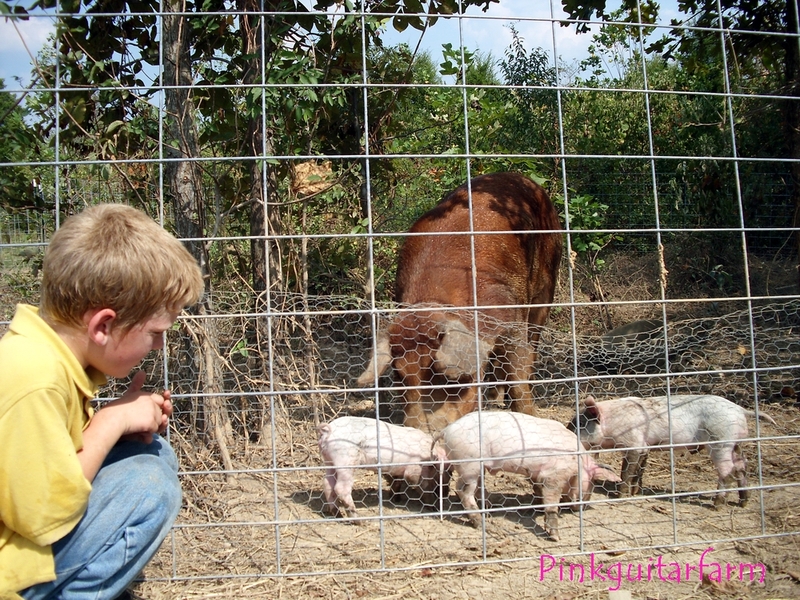 The above picture shows our boar with his first batch of piglets. Notice that we put up chicken wire to keep them OUT of his pen. We learned the answer to the question “where do little piglets go when their mother is not looking?” Answer: wherever they want! I’m sure the text was fantastic… I just couldn’t get past the overwhelming cuteness on the screen! (Jack and Sophie) that is. Good work, it is an interesting blog! !